Turkey Burglers! | Gunna Finish That? 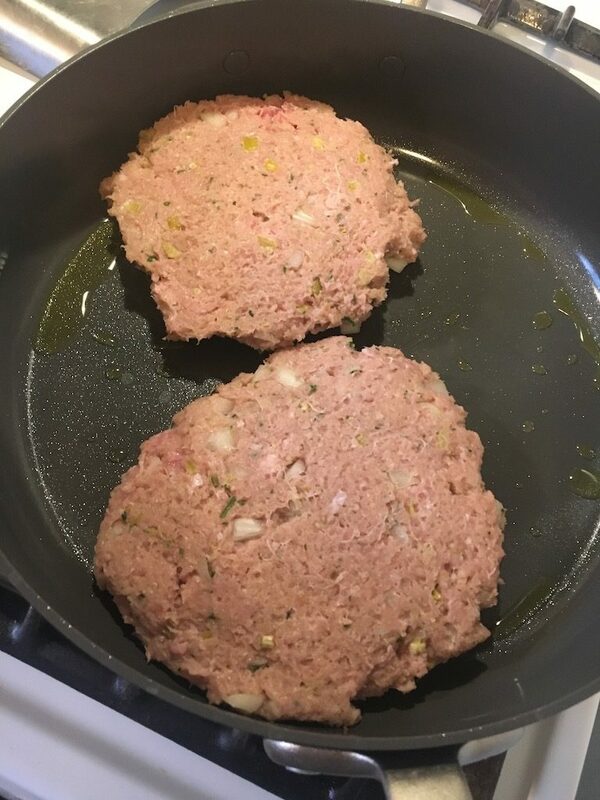 We’ve been using the organic ground turkey* from Costco for these and I’ve found that defrosting the meat in the microwave gives it a different consistency that I don’t really care for. So, we have to plan ahead and defrost in the fridge, or make ’em fresh after purchase. *I’m sad to report that the turkey from Costsco is Butterball brand. Get out your favorite medium-sized bowl and crack the egg. Using the shell halves to separate the yolk from the white, let the white fall into the bowl and do whatever you want with the yolk (I compost it with the shell, but we’re toying with the idea of using the whole egg next time). Whip the crap out of the albumen so it gets air bubbles. Sprinkle in your garlic and parsley (I will confess here, that I use McCormick Minced Garlic and Lighthouse Parsley because they are super-convenient). Add to the bowl some chopped-up white onion and diced-up pepperoncinis (these can be mild or hotish, so know your audience). 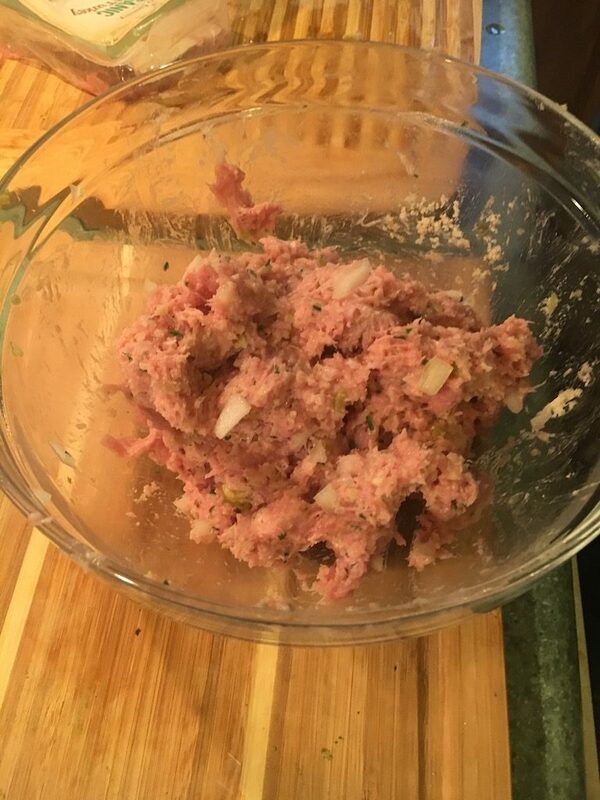 Throw the hunk of raw, ground turkey into the bowl and start to incorporate everything with your hands. Doing this is kinda squishy, so you and your cookin’ partner will have to Rochambeau over the task. The person whose hands are the cleanest gets to pour in the panko crumbs. I haven’t used regular ol’ bread crumbs, but if that’s all you have at hand, give it a try! Raw meat never looked so good. After the panko is mixed in, make a slow-motion karate chop through the center of your bowl and eyeball two halves. Get the panko-pourer (i.e., the person with clean digits) to lay out two pieces of waxed paper. The patties will hang out here until the pan is ready. Yes, it will be messy. Heat up a drizzle of oil over medium and start the oven (to warm up the buns—skip this part if you’d rather). 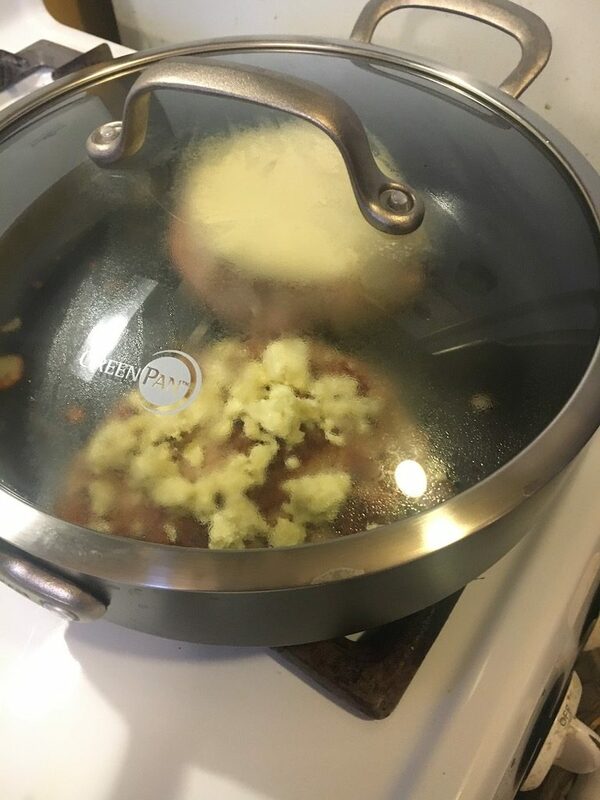 When the pan is heated, carry your patties over and plop ’em upside down. 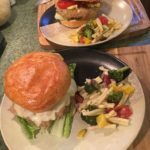 These are big burgers, and they take about 10 minutes per side, so this is a good time to get your condiments out of the fridge and prepare your toppings. That is an 11.25″ pan. After 10 minutes, peek at the bottom. When they’re sufficiently browned, give ’em a flip. 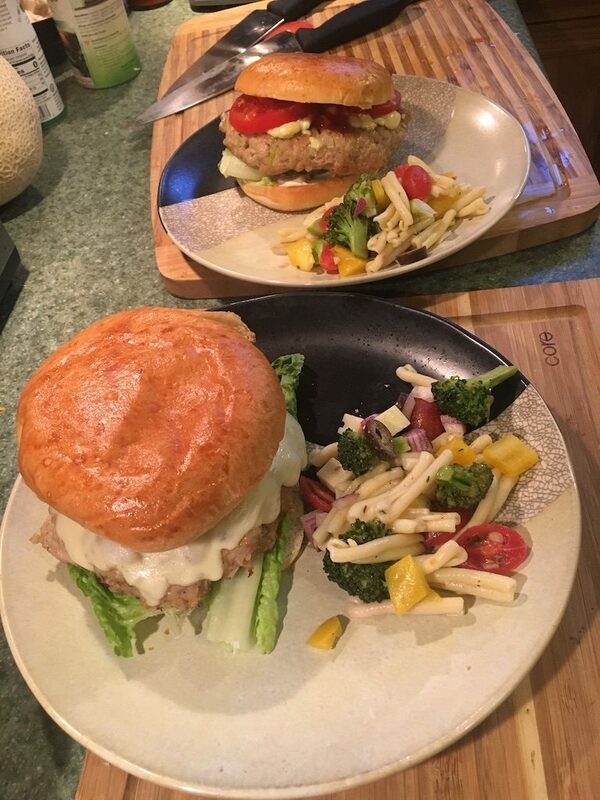 We recently found the best buns for these burgers; they can handle the heft and don’t get soggy while you’re eating. 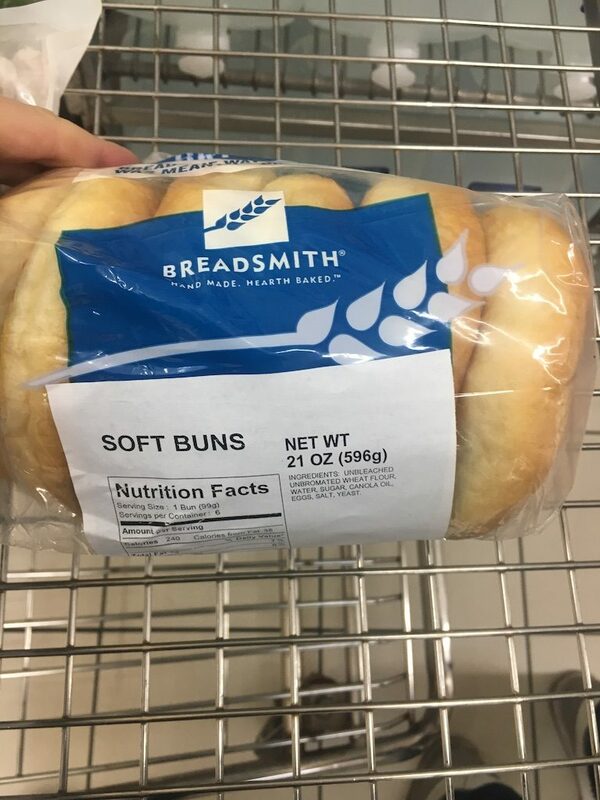 Throw them in the oven to toast for about 5 minutes. Into the oven for a warm-up. A secondary attribute of these that I like is that the list of ingredients is as short as it should be. These are the absolute best. This is when having a digital meat thermometer is really handy. Find the thickest part and slide the business end of the thermometer in half way. If it doesn’t read at least 165°, don’t touch ’em. If it’s close (160°-close), top with cheese and cover for 3 to 5 minutes. We load ’em up with mayo, mustard, lettuce, tomato, and raw onion; but since it’s your face, you can put whatever you like on them. Sometimes we have a side, like pasta salad or putt-putts (the posts for both of which are on my list), but sometimes the nearly 1/2 lb. 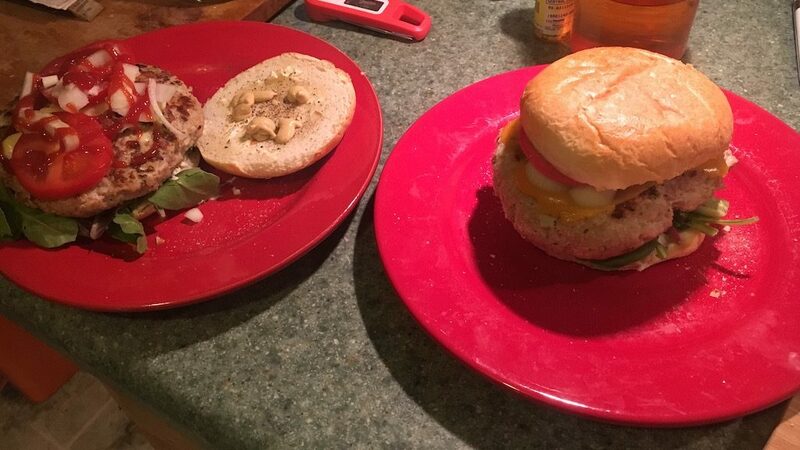 burger is just enough. With Italian pasta salad (post coming soon). 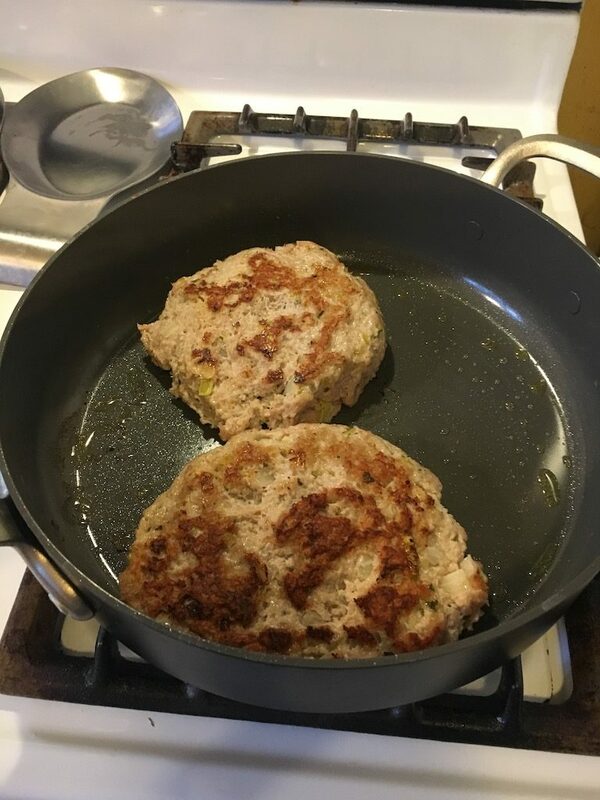 Turkey burgers flying solo. Get it? 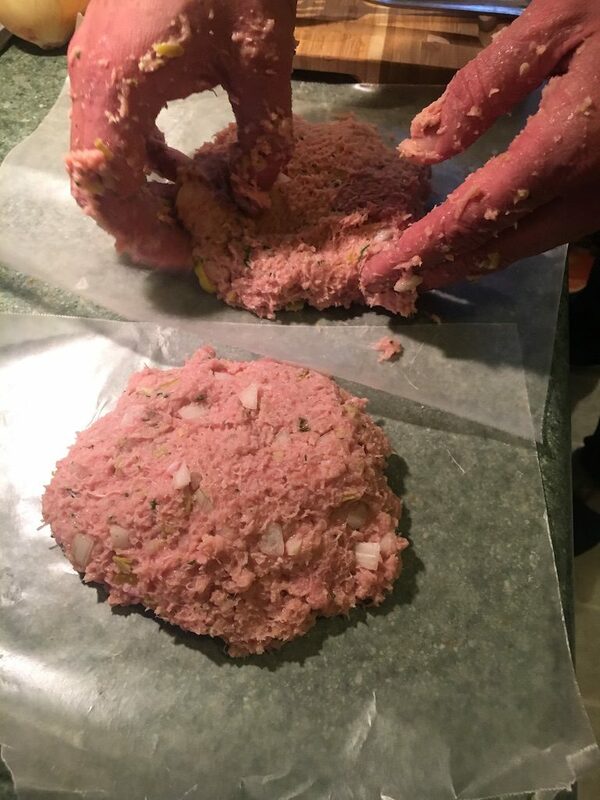 Ground turkey with deliciousness mixed in. In a medium bowl, beat egg white until fluffy. Stir in parsley, garlic, onion, peppers until fully mixed. Place turkey in the bowl and mix up with hands until everything is fully incorporated. Add panko and mix gradually until well distributed. Place a large pan over medium heat with a drizzle of olive oil. Divide turkey mixture in half and place each half on its own piece of wax paper and shape into a large, flat patty. When the pan is hot, place each patty and cook 10 minutes on each side or until the center of the largest part reaches at least 165°. When patties are cooked, place cheese on top and cover for 3 minutes, or until cheese is melted to your liking. 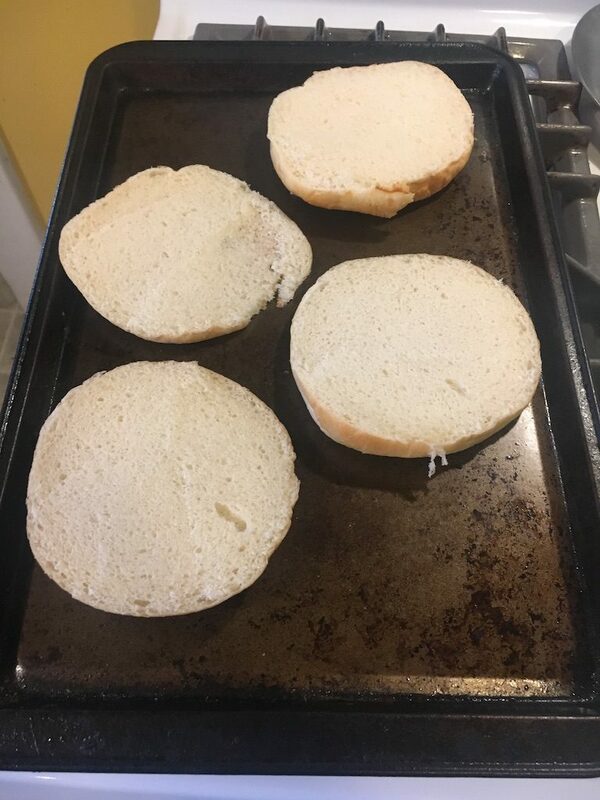 Transfer patties to your toasted buns; garnish with mayo, mustard, tomato, and sliced onion. Go to town!